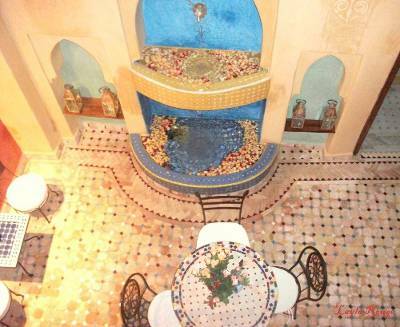 If Riad Layla Rouge could, it would cascade chocolate from the fountain in the courtyard, but the impact is truly mouth-watering nonetheless. Tea and cake, free all day – may stop you from biting into the walls – or maybe not…they may actually be edible. Only one minute from the main square, the 3 suites provide absolute privacy, the gorgeous mixed dorm encourages adventure sharing. All can enjoy the warm, communal atmosphere of the courtyard, Moroccan salon-dining room, and 2 flower and fruit tree draped roof terraces. All this enhanced by your own personal soundtrack with ipod speakers in each room. You cannot help but find your favourite colour here – by day Layla Rouge is a vase of flowers or a box of hand decorated chocolates, or an techni-flavour ice-cream stand; by night a treasure chest of glittering jewels, or a sparkling solar system. Use your imagination. 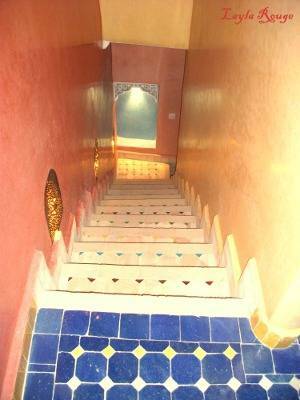 Riad Layla Rouge wants you to get comfy in Marrakech; to feel safe and happy; imaginative and inspired – we combine a hostel spirit and atmosphere with that little bit of indulgence that you find in a luxury riad. Share your stories of travel and life. Laugh over tea and cake with other guests in our (almost) edible house. Whether you are travelling for the first time, or have done so for years – enjoy the rhythm of a city that transforms with the cycle of the sun. 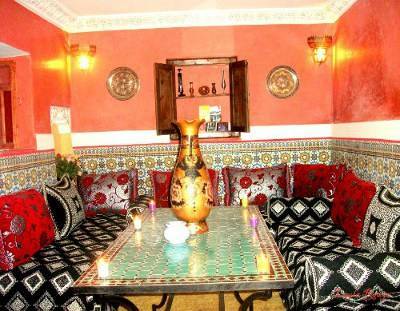 When you stay at Layla Rouge you can’t be anywhere else but the Wonderland of Marrakech. 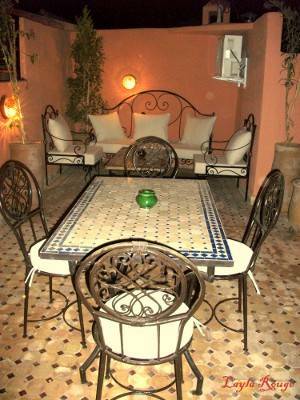 We have several communal areas including a traditional Moroccan salon-dining room with satellite TV and DVD player and a selection of films, a delicious courtyard with fountain and 2 roof top terraces for chilling out in the evening or sunbathing during the day. Each room is a suite with salon area and shower facilities, and we have one dorm room with ensuite and giant red bath and shower! 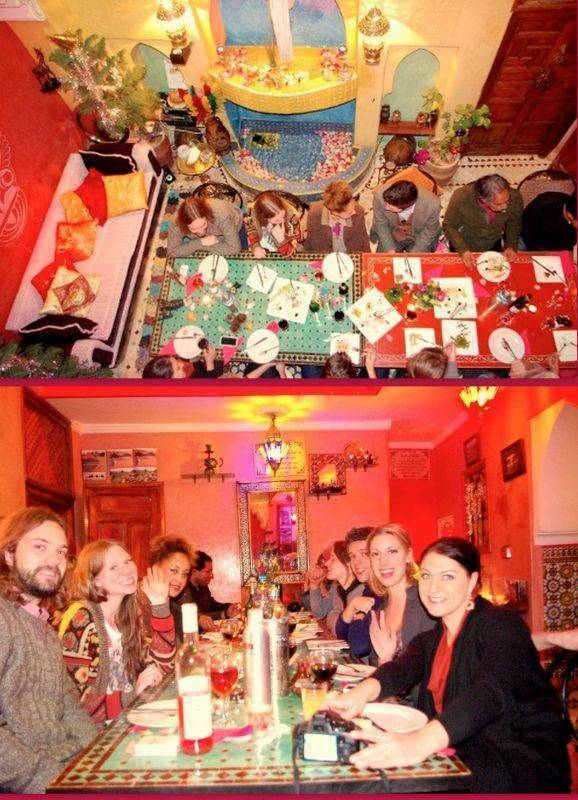 Our kitchen is available for guests to use - either to prepare your own food, or to take a cookery class in Moroccan cuisine. We also have facilities to wash clothes. We also have one large, delicious 6 bed mixed dorm with ensuite. This is no normal ensuite - it has a giant red bath (there is a shower too!). The room has a safe to lock aware any valuables should you wish to. 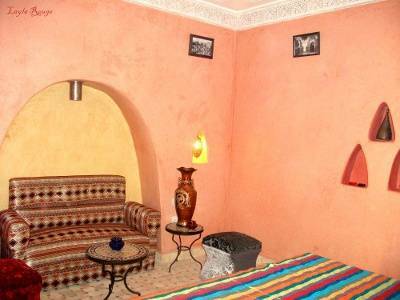 Riad Layla Rouge is in the most exclusive and most central area of the Medina - el Ksour - in the middle of the main souqs, and only a minute from Place D'Jeema el Fna. To the left of the Cafe is a small square call BAB FTEUH. There is a PHARMACY. Left of the pharmacy is an ARCHWAY . Walk through and straight on until a boutique called FNAQUE BERBERE. Turn left and straight on. There is a large FLOWER-SHAPED ARCHWAY. At the end of the street is a mosque and wood-carving boutique. There is a tiny tunnel to the right. Walk through it. This is Derb Rokni. RIAD LAYLA ROUGE is the 1ST DOOR ON THE LEFT - NUMBER 23.